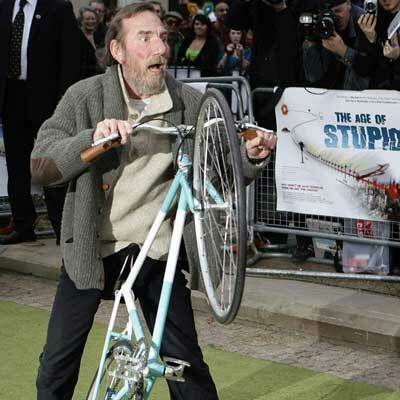 At The Age of Stupid premier in London, actors arrived on bikes, rickshaws, and solar cars. Unfortunately, this shot looks like the actor Pete Postlethwaite is fighting the paparazzo with his bike or he’s homeless and someone is trying to steal his bike. Here’s another mellower version. And this one where he’s fighting the power with his bike. There’s no badge on that bike, but it looks fixed and with a nice paint job. Vivienne Westwood and her husband Andreas Kronthaler also arrived on bicycles.